3.0 Why Perforate Revenue Stamps with Perfins? Firstly let me welcome you to a brand new concept in collecting Revenue perfins. This publication came about out of frustration as to the lack of specialised information regarding revenues punctured with perfins. Previous listings of revenues with perfins did just that, they listed a perfin pattern on a revenue from a particular Australian State with or without a company address, that was it. There was no list of which issue the perfin was found on. In the past revenue perfins have just been lumped in with postage stamps, not a good situation for the collector of revenues. This publication strives to bring revenue perfin collecting out of the dark ages and into the 21st Century. Armed with information about the companies, as up to date as possible with background on patterns and devices found on all the various issues of revenues. It is hoped that a collector armed with this new concept in catalogues may then have the desire to take his or her collecting further by exhibiting there perfins. The short answer as to why they were perforated was to stop pilfering. Just like postage stamps, revenue and railway stamps needed to be protected from theft and misuse. 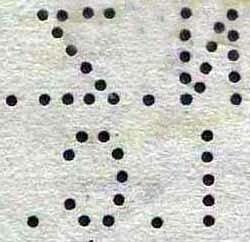 The term perfin [Perforated initials] was coined by a New York collector in 1943, a Mr. H. Card. 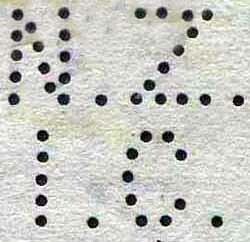 In the UK about the same era SPIFS [Stamps Perforated by Initials of Firms and Societies] was used. The accepted definition of a perfin in Australia is a stamp which has initials or any figure or design perforated into it by a business, society or other organization. Collecting the various positions of perfin patterns on stamps can be challenging and fun. 1 Upright. 2 Side up. 3 Inverted. 4 Side down. 5 Reversed upright. 6 Reversed side up. 7 Reversed inverted. 8 Reversed side down. Accurate pattern images are the key to the identification, study and collecting of perfins. Sometimes different devices in remote locations produced patterns which look very similar. The authors have gone to considerable trouble with drawings and scans to ensure that they are as accurate as possible. The images imbedded into the internet pages on each alphabetical pattern are not ideal as a reference to compare your patterns against. As a result the authors have created two tools for you to use in comparing your patterns to the reference pattern. Firstly there is a series of 1:1 scale images of with the patterns as they appear in the catalogue. Secondly the authors have made available the same set of images in black on several transparent sheets [©Perfin Finder]. 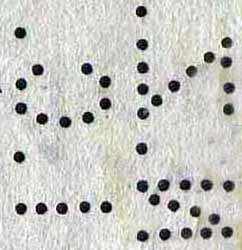 This is to allow you to confirm the pattern types where the stamp is still affixed to a document or on piece. If you find that either of the above does not fit your patterns, or has any distortion then please contact us and we will replace them. The related issues of pricing and scarcity are vexed ones and we approach them with caution, as in the past, detailed scarcity listings offered in some catalogues have provided forgers with the information that they need to target rare positions and issues. We should all be vigilant and sceptical when new information or patterns surface and know that communication and our shared collective knowledge offer the best protection against this problem. Scarcity ratings need to be seen in the context of our area of focus, that is, revenue and railway stamps. Revenue and railway stamps are less common than postage stamps with the latter even more so. If a pattern is found on a postage, revenue and railway stamp the relative scarcity is effected by the type of stamp it is found on. 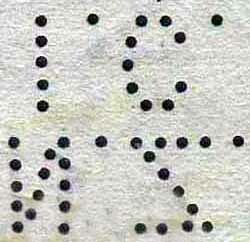 For instance the pattern of Thomas Brown and Sons, TBS is very common on postage stamps, yet it is much harder to find on a revenue stamp and deserves a scarce or rare rating. It is occasionally found on railway stamps and would command the highest rarity rating. The following ratings have been chosen R1 - R5 with R5 the rarer. Pricing is an even more difficult issue and when very rare patterns surface. Market forces will determine the price. I think it would be presumptuous to predict pricing trends as the collecting of this sub set of Australian private perfins is at an early stage. The authors decided to use their own numbering system of A-Z letters. 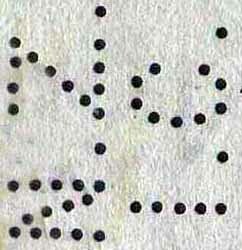 The pattern letters being used as the basic describer of the pattern but with a letter rather than a number to differentiate between similar letter combinations. So the pattern AACO within this publication becomes AA/CO.a. Because this series of catalogues are built up in a State by State format the pattern description AA/CO.a may appear in more than one States catalogue but actually refer to different patterns. This could be confusing, but the existence of and a relationship to, other State patterns will be covered in each pattern description. 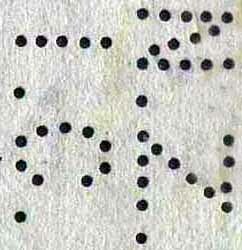 We also include an oblique stroke (/) to indicate the structure of the pattern. For instance for AA/CO this indicates that the AA and the CO are on different lines within the pattern. The authors grant permission to collectors, auction describers and other perfin traders or sellers to use and quote the numbering system within this series of catalogues, prefixed with “Elsmore/Coath No.". 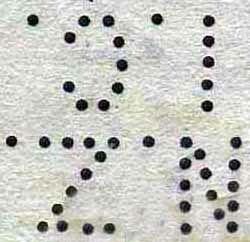 This catalogue lists the Perfins, Security Overprints and Cancelling devices Alphabetically A-Z based on the starting letter of the pattern/overprint. The Perfins are listed first and the Security overprints and Cancelling devices are listed in the “Other” section after the Perfins. Within each letter group the patterns are presented lexicographically (i.e. as words are ordered in a dictionary) by reference to the letters in the pattern rather than the name of the user. Therefore L.a for Lowood Creamery precedes LLG.a of Liverpool and London and Globe Insurance. When there are a group of patterns with the same letter sequence, e.g. VOCO.a, b, c, and d; we have attempted to list them in chronological order. This is not always possible as usage periods are not always known and some usages overlap. Within these pattern groups of the same letter sequence there are sometimes variation in pattern structure, e.g. 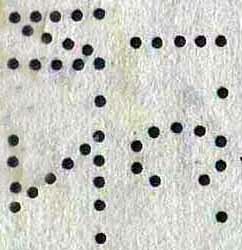 the VOCO group has patterns noted as VOCO.a, b, c, and d, which are in a single line and VO/CO.a which is in two lines. In such instances the single line format patterns will precede the two (or three) line format patterns. In some instances a device will be modified during its lifetime and this produces variation in the detail of the pattern. For example the LLG.a pattern is found in 3 different states over its long life. Such variations are described in the “Device” section for each pattern but if they are the result of a modification to a single device at a single location, then they are covered within the same catalogue listing. In some isolated instances devices are known to have moved and at the same time been modified and /or repaired and because this involves a listing in a separate State catalogue these are treated as a separate listing. The “Device” section will detail the relationship with other similar devices/patterns. 2 Multiple die devices with identical dies. Some patterns are known to have been created by multi head devices e.g. TBS.a which is a four head device. The four patterns created by the four die heads are essentially identical, so they are considered to be a single pattern and are given a single listing. The dies are numbered I, II, III and IV in order to permit discussion of the layout and the very minor variations in their characteristics. 3 Multi die devices with different dies. Some multi die devices create patterns that are clearly different e.g. LLG.a .b .c and .d from NSW are most likely created from a four die device but the patterns made by the dies are clearly different. Given their different appearance these patterns are given separate listings but the relationship between the patterns is detailed in the “Device” section for each pattern.